Sure, the Edmonton Oilers were lodged near the bottom of the NHL standings again last season, but something changed in Central Alberta. The Oilers, led by a trio of talented phenoms, were fun to watch again, and a legitimate sense of hope evolved. Watching a team lose enough to secure Taylor Hall, Ryan Nugent-Hopkins and Nail Yakupov is not a lot of fun, but the end result -- a team that can compete for the Stanley Cup for multiple seasons -- might just be near for Oilers fans. Hall, Nugent-Hopkins and Jordan Eberle were electric together when healthy. Maybe just as important were the steps forward for defenseman Jeff Petry and goalie Devan Dubnyk as the Oilers try to put together a well-rounded roster. 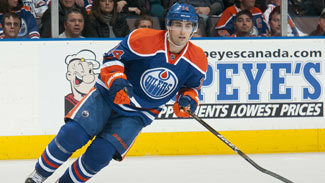 Under-valued: Jordan Eberle – Went from 18 goals and 43 points as a rookie in 2010-11 to 34 goals and 76 points last season, which were each tied for 15th best in NHL. Might not reach those numbers again, but who’s complaining if he posts 30 goals and 65 points as a minimum? Over-valued: Ryan Smyth – Got off to a hot start with 24 points in first 25 games last season, but slipped to just 22 in final 57 games. Points total has dropped in each of last four seasons and will likely do so again in 2012-13. Sleeper: Devan Dubnyk – As Oilers continue to improve, no one will see a greater fantasy impact than Dubnyk, who has plenty of talent to display. Finished with 20 wins and 2.67 GAA last year and should emerge as the clear-cut No. 1 starter this season. Yakupov is the next great forward prospect to join the club, although winning the Justin Schultz sweepstakes may prove just as significant as winning the draft lottery to select Yakupov. They were the only major additions this offseason for the Oilers, but name another franchise outside of Minnesota that added two (potential) franchise players? Obviously, Yakupov and Schultz still need to prove they can be those types of players, but there is more reason for excitement in Edmonton as the Oilers could be back among the NHL's elite teams in the next year or two. NOTES: The big name missing among the forwards is Magnus Paajarvi. If he proves his down season was a fluke, there's a good chance he earns a spot on the team and likely on the second or third line. That would cause a ripple effect in what is already a crowded situation. If Paajarvi doesn't make the team, there is still plenty of potential fluidity behind the top line. Yakupov might be the only guy among the six forwards on the second/third lines who is definitely going to get top-six treatment. Hemsky, Smyth and Jones could all bounce back and forth or be shifted around. Smyth, Horcoff and Hemsky would certainly be an expensive third line. Whitney could factor into the top four on defense if he can find his form from a few years ago, but otherwise it looks set (and potentially pretty strong pending the younger Schultz's impact). Potter, Sutton and Theo Peckham will battle for the final spot in the lineup, and all eight guys could be on the roster pending how many forwards are kept. Expect to see Dubnyk play a little more this season if he stays healthy, and expect his numbers to look a little better as the defense corps improves in front of him.